Elbląg [ˈɛlblɔŋk] ( listen) (German: Elbing [ˈʔɛlbɪŋ] ( listen)) is a ceety in northren Poland wi 124,257 indwallers (December 31, 2011). It is the caipital o Elbląg Coonty an haes been assigned (syne 1999) tae the Warmie-Masurie Voivodeship. 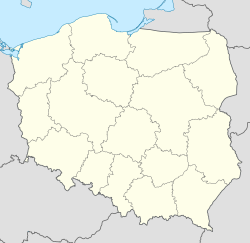 Previously it wis the caipital o Elbląg Voivodeship (1975–1998) an a coonty seat within Gdańsk Voivodeship (1945–1975). ↑ Ludność. Stan i struktura w przekroju terytorialnym. Stan w dniu 31 XII 2011. ↑ "Trowbridge - Market town twins with Arab city". BBC News. BBC News Channel. 2006-10-03. Archived frae the oreeginal on 2007-10-21. Retrieved 2013-08-01.